I have a thing for orange cakes. I’m not really sure why, I’m not a fan of most fruit cakes, but orange cakes fall into a category of their own. The original recipe for this pairs the cake with a simple glace icing flavoured with orange juice but I found that a cream cheese icing works better for a stronger, less sickly-looking cake. 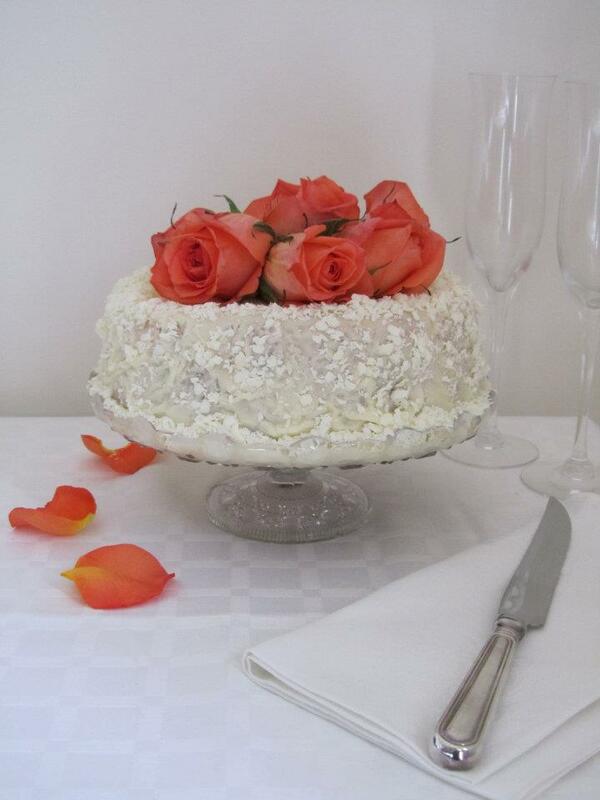 Here I have gone over the top with fresh roses and white chocolate shavings but you can decorate it as simply as you like. Preheat oven to 170°C. Grease a deep 22cm round cake-pan; line base and sides with baking paper, extending it 5cm above the top of the pan (this will make getting it out easier and will assist with the cooking process). Beat butter, rind and sugar in a medium bowl with an electric mixer until light and fluffy. Add eggs one at a time, beating until just combined between additions. Mix in flour and juice in two batches. Pour the mixture into the prepared tin and bake for approximately 1 hour and 10mins then carefully turn onto a wire rack to cool. Place cake top-side up onto a serving plate or cake stand then spread cold cake with icing and decorate as desired. To make the icing, beat butter, cream cheese and rind in small bowl with electric mixer until light and fluffy, gradually beat in icing sugar. Adapted from the Australian Women’s Weekly’s “Buttery Orange Cake” in the 2002 ‘Best Food’ cookbook. Thank you! I love the look of fresh flowers on cakes.